Support gun rights and receive a Custom Firearm Coloring Book! You have been one of our most valued supporters in the fight for your fundamental rights! 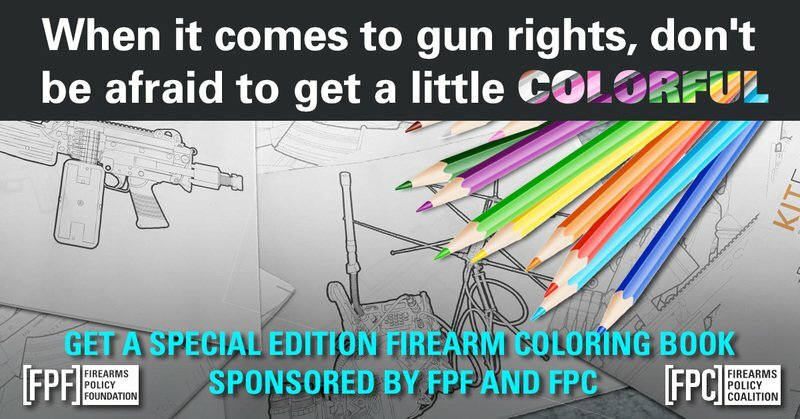 That’s why, for a limited time, we’re offering you the opportunity to receive a Special Edition Firearm Coloring Book sponsored by Firearms Policy Foundation and Firearms Policy Coalition! These books would make an excellent display piece, a fun project for art-inclined gun owners, or even an opportunity to include the whole family in your love of firearms. But there's only a small number of these left, and they are bound to go fast! On a donation of $25 or more, you will receive one of these limited-edition firearm coloring books. So what are you waiting for? Support the Second Amendment and get your very own firearm coloring book NOW! Your generous donations to Firearms Policy Foundation (FPF) go directly to the front lines of gun rights and support critical pro-gun efforts like legal action and outreach. FPF is a 501(c)3 nonprofit organization. Contributions to FPF are tax-deductible.